If you want someone dead in Afghanistan, all you have to do is yell, "She just burned a Qur'an!" The lynching that follows will even be defended by police and Muslim clerics. 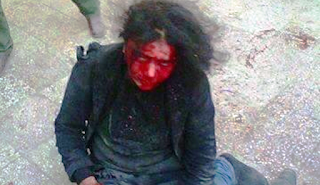 KABUL (Reuters)—An Afghan cleric and a police official on Friday defended the lynching of a woman in central Kabul after a mob was filmed stamping on the woman and smashing a brick on her head after she was accused of burning a Koran, Islam's holy book. This is unthinkable, yet it is here right before us. This tragic and unimaginable death has been the fate of millions of women in the course of Islamic history. Social media brings these atrocities to our doorstep, filmed and released by the very people who perpetrate them. Islamic scholars and Imams are right now answering the questions of Muslims by saying "This is not Islam, these people are just illiterate Muslims who don't understand the Qur'an". Any intelligent Muslim believer must realize in their heart that this excuse is a lie. Islamic scholars and authorities who can recite the Qur'an in its entirety, experts in fiqh, and teachers of millions give both silent and verbal consent to such violence. If they say something, it will be that the mob did not have the authority to kill this woman, NOT that she should not be killed! They will criticize the method and the misuse of authority, they will explain Shari'a law but they will not and cannot say that murdering a supposed heretic is wrong! For those who are seeking truth, this flimsy torn veil of excuses and lies must be growing ever thinner. I have just read a Muslim believer who wrote "This is not what Islam teaches, these men do not understand Islam!" by murdering someone who they claim is a heretic. You cannot keep explaining away the violent commands in the Qur'an by claiming they were given in the context of a violent age. Jesus lived in a violent time, but His response to violence was to meet it with the power of love. Beyond the mob, however, look at how people responded. Some police stood by and watch, nobody tried to intervene; no cleric called for calm; the government initially was content to be silent, the poor woman's father lied about her and was content to label her as insane rather than defend her. This woman was killed by a mob, but betrayed, it seems, by everyone around her! Did the ACCUSER not LIE about her burning the koran? That she had some argument with some who sold some items, she felt was worthless? And to protect their own income they simply lied? As Wafa Sultan has pointed out it is the evil genius of Islam that Islamic law does not say executions of blasphemers have to be done by official executioners - your neighbor can do it. Thus is Islam maintained by terror. Recall a thousand Pakistani clerics asked resident Asif Ali Zardari to pardon Mumtaz Qadri, the policeman sentenced to death for assassinating Punjab governor Salmaan Taseer in 2011.